Don’t you wish good things could last forever? You’ve been there. We have, too. But the reality is that things don’t usually go the way we plan. When you least expect it, life throws a curve ball your way. The way kitchen appliances work is no different, and that especially means the ones we use every day. Garbage disposals are an essential kitchen convenience for most homeowners that are used pretty much every day. Prepping food and cooking becomes much easier when peels and other scraps can just be tossed into the sink and straight down the drain, but over time, all that will take its toll. We apologize in advanced for stating the obvious, but… garbage disposals absolutely do not last forever! No matter how well it’s made or how much money you spend, any appliance that is exposed to thousands of gallons of running water, dish soap, scraps of food, bones, and the rare (we hope) spoon or lime wedge that accidentally gets dropped into the drain is going to wear out in due time. A unit that’s working well should be able to handle a few scraps of veggies or apple slices in a matter of a couple of seconds. If your garbage disposal seems to take forever to accomplish a simple grinding job, makes a strange noise or emits a nasty smell, it may be time to install a new one. Here are some problems that every garbage disposal can run into, old or new. Learning about your garbage disposal and how it works (and how it doesn’t work, of course!) is the first step to decide if it simply needs a repair or if it needs to be replaced all together. One thing that stands for any and all situations: never stick your hands down the drain! If you have a unit that is working great and is quiet, then you’re in good shape. Nowadays there are many very powerful units to choose from with a high horsepower that aren’t necessarily that expensive and perform perfectly and very quietly. However, if it’s on, not grinding and not making any noise, then Houston, we’ve got a problem. First, – and this may seem obvious, but- make sure the disposal is plugged in. With that said, let’s get to the bottom of this. If it is plugged in then press the reset button, which can be found on the bottom of the unit and is usually red. You should see the button popped out- press it. If that doesn’t work, make sure the circuit breaker hasn’t tripped and turned off in the electrical service panel. If the breaker has not tripped and the reset button is not popped out, then it could either be a damaged switch or a damaged unit all together. If the disposal will still not turn on and makes no noise, the garbage disposal is beyond repair and needs to be replaced. Unless you have a solid background as an electrician, we really don’t recommend you try replacing the switch yourself. Give us a call at John Moore Services first and make sure you take the proper, safe steps. If water is leaking from the disposal it more than likely needs a seal replaced but also could be a more serious problem. A leak can occur at the rings that are installed around the sink’s drain hole, called the sink flange. In that case, it can either be that the rings need to be tightened or that the plumber’s putty is faulty and needs to be reapplied correctly. Sometimes garbage disposals can get a hole in the case itself as the wall wears down, or a foreign object that gets into it (who hasn’t lost a spoon down the disposal?) can crack the casing. Holes and cracks are pretty common in older garbage disposals. Leaks can also happen at the dishwasher connection and the discharge drainpipe. The dishwasher connection may simply need the clamp tightened or need a replacement hose. For the drainpipe, tightening the bolts may help, but if that doesn’t work, the gasket may need to be replaced. No matter the situation, it is best to give us at John Moore a call rather than trying to replace these things yourself to make sure it is done correctly and to make sure the problem doesn’t get even worse. When something blocks your disposal unit’s flywheel, you will start hearing a low humming sound, and you know you’ve got a jam. 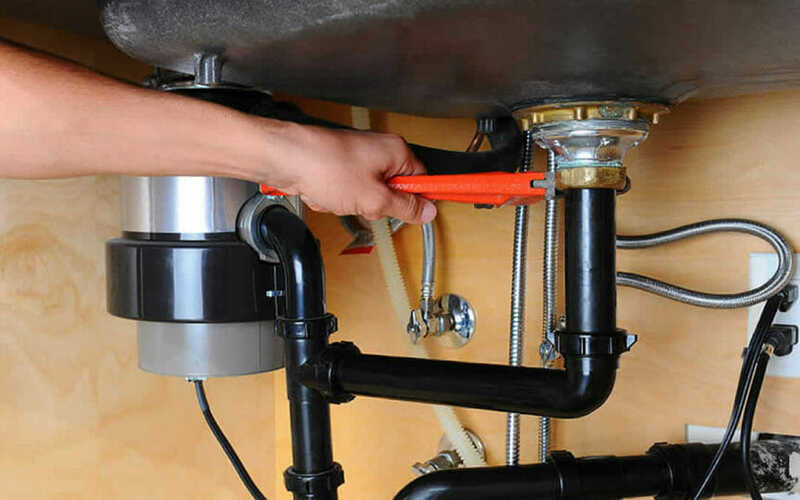 Un-jamming a garbage disposal is something that depends on the specific unit you own. Every single one has a function to shut off when they are stuck to the point of stalling the motor. This is so the motor doesn’t burn out. However, they are also designed so that anyone (and we mean anyone!) can remove whatever it is that is blocking your unit. Underneath every unit is a small slot, and pretty much all of them come with a tiny little wrench to match it. These are most commonly called hex-head wrenches. Yes, that little tool that you probably have no idea where it could possibly be has a very specific and important purpose. Mind blown, right? If you misplaced your wrench that came with the unit, don’t worry. The store you got your unit from should have replacements for as little as $3 to $5. An Allen wrench will usually work well, too. Replacing the motor is the most costly repair for a disposal, so replacing the unit may be your best bet. If the disposal is jammed and won’t budge after using your wrench, turn it off and call us right away. Not all garbage disposals have the unjam spot on the button. A lot of builder grade garbage disposals 1/3 HP do not have this feature. These units require a special tool to unjam them from inside where the blades are. Some jams you can free and get the motor to spin and sound like it is working, but the blades are stuck in one position and can’t spin freely to do their job properly. This is very common problem – the motor works so we think everything is working. Not the case! This can lead to stoppages, food trapped in the disposal and a bad smell. These blades can’t be repaired. The disposal needs to be replaced. If some bad odors are coming from your disposal, it can mean that it is not chopping up the food finely and there are drainage issues. Try putting lemons peels (not wedges, y’all) through it first and see if that removes the odor. If that doesn’t help or if the smell returns frequently, that may be telling you that that the disposal isn’t swallowing and chopping up your leftovers correctly. A foul or foreign odor emanating from the garbage disposal that won’t go away no matter how thoroughly you have rinsed it, may also be a sign that it’s time to replace it. As the components in the grinding chamber wear out and the blades get duller and duller, food can easily get trapped inside and start to decompose. You may never have noticed the smell or have chosen to adapt and wait it out, but it may be a sign of a deeper problem. Visiting family members and dinner guests probably wouldn’t appreciate it very much, either. Not working at all and you’ve tried everything? This could happen for any of the above reasons and beyond. If you absolutely know it’s time to get a new unit installed or are too wise to tackle a complex plumbing and/or electrical problem yourself, give us a call and we will be ready to find the source of the problem or help replace your unit in no time. Most garbage disposal manufacturers provide a range of models to choose from with ever-increasing power ratings. If you do a ton of cooking and use your disposal frequently, then spending a little extra on a 3/4 or 1 horsepower disposal will absolutely be worth the money. Not only do the more powerful units shred through food scraps much easier, but they can also handle harder objects such as bones or meat scraps that might jam a smaller, weaker disposal. As mentioned before, powerful disposals are less noisy and they tend to have only occasional damages. However, one downside of having larger, more powerful disposal is that they will require more space. No matter what your habits, likes, and dislikes are, it’s always best to consult with a John Moore tech before buying a new disposal to make sure it will fit under your sink and perform how you need it to. Here is a list of Consumer Search’s top 4 garbage disposals. It gives you a great description of each and has a good range of high to low prices for people of all budget sizes, just to give you an idea of what you’re dealing with. This is extremely important because it helps to keep your drain and sewer system free of clogs caused by grease or food waste from faulty garbage disposals (and occasionally irresponsible homeowners). We hate to say it, but stoppages in garbage disposals are generally due to “operator error”. Either we have put too much in at one time or tried to force something through, smashing it with a spoon (there is that pesky spoon again!). Pasta, rice and salad are killers of garbage disposal drains and really need to be put down the drain in small amounts; if you put half a pot of rice in at the same time you definitely stand the change up plugging up the pipes under your sink. Avoid pouring grease, cooking oil, coffee grounds, or other oily substances that can build up in your drain lines and cause clogs. Avoid putting large chunks of any food, starchy foods such as potatoes or pasta that build up a sticky paste and clog up your drain, and tough meat scraps into your disposal because these can cause jams and/or cause major damage to the blades. For disposal jams, use the wrench that is designed for the slot under your disposal to release most jams. Usually, that’s all it takes! Call the plumbers at John Moore to take care of the issues for you if you aren’t sure how to do any repairs or maintenance yourself. As the saying goes, it’s better to be safe than sorry. We like to think that motto works every single time, so never be too embarrassed to ask us all your questions. We love to help! It’s what we do, and won’t ever stop doing.